The combined federal drug control budget request for Fiscal Year 2018 is $27.57 billion, up from $23.8 billion in 2013. 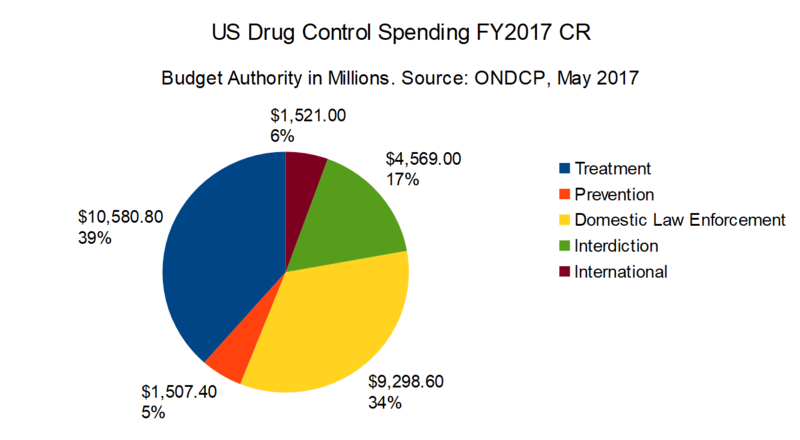 Click here for complete datatable for Federal Drug Control Spending by Function FY2013 through FY2018 as estimated by the Office of National Drug Control Policy. ONDCP changed its method of accounting for treatment spending in its FY2018 report. According to footnote two for table two, p. 18, in the FY2018 budget report: "The estimates for the CMS [Centers or Medicare and Medicaid Services] reflect Medicaid and Medicare benefit outlays (excluding spending under Medicare Part D) for substance use disorder treatment; they do not reflect budget authority. The methodology for Medicaid estimates has been refined from prior years to more accurately reflect spending. The estimates were developed by the CMS Office of the Actuary." Questions have arisen regarding this decision, so in order to provide a better understanding of these figures, click here for a complete datatable of Federal Drug Control Spending by Function FY2008 through FY2016 and the request for FY2017 as estimated by ONDCP in December 2016. "National Drug Control Budget: FY 2018 Funding Highlights" (Washington, DC: Executive Office of the President, Office of National Drug Control Policy), May 2017, Table 1, p. 16; Table 2, p. 18; and Table 3, p. 19. "FY 2017 Budget and Performance Summary" (Washington, DC: Executive Office of the President, Office of National Drug Control Policy), December 2016, Table 1, p. 21, and Table 3, p. 24. "National Drug Control Budget: FY 2017 Funding Highlights" (Washington, DC: Executive Office of the President, Office of National Drug Control Policy), February 2016, Table 1, p. 16; and Table 3, p. 19. "The President’s FY 2018 Budget Request supports $27.8 billion for drug control efforts spanning prevention, treatment, interdiction, international operations, and law enforcement across 14 Executive Branch departments, the Federal Judiciary, and the District of Columbia. This represents an increase of $279.7 million (1.0 percent) over the annualized Continuing Resolution (CR) level in FY 2017 of $27.5 billion. Within this total, the Budget supports $1.3 billion in investments authorized by the Comprehensive Addiction and Recovery Act (CARA) the 21st Century Cures Act, and other opioid-specific programs to help address the opioid epidemic." "National Drug Control Budget: FY 2018 Funding Highlights" (Washington, DC: Executive Office of the President, Office of National Drug Control Policy), May 2017, p. 2. The White House Council of Economic Advisers [CEA] released its analysis of the economic costs of illegal opioid use, related overdoses, and overdose mortality in November 2017. It reported a dramatically higher estimate than previous analyses, largely due to a change in methodology. Previous analyses had used a person's estimated lifetime earnings to place a dollar value on that person's life. According to the CEA, "We diverge from the previous literature by quantifying the costs of opioid-related overdose deaths based on economic valuations of fatality risk reduction, the “value of a statistical life” (VSL)." The CEA noted that "According to a recent white paper prepared by the U.S. Environmental Protection Agency’s (EPA) Office of Policy for review by the EPA’s Science Advisory Board (U.S. EPA 2016), the EPA’s current guidance calls for using a VSL estimate of $10.1 million (in 2015 dollars), updated from earlier estimates based on inflation, income growth, and assumed income elasticities. Guidance from the U.S. Department of Health and Human Services (HHS) suggests using the range of estimates from Robinson and Hammitt (2016) referenced earlier, ranging from a low of $4.4 million to a high of $14.3 million with a central value of $9.4 million (in 2015 dollars). The central estimates used by these three agencies, DOT, EPA, and HHS, range from a low of $9.4 million (HHS) to a high of $10.1 million (EPA) (in 2015 dollars)." In addition, the CEA assumed that the number of opioid-related overdoses in the US in 2015 was significantly under-reported. According to its report, "However, recent research has found that opioids are underreported on death certificates. Ruhm (2017) estimates that in 2014, opioid-involved overdose deaths were 24 percent higher than officially reported.4 We apply this adjustment to the 2015 data, resulting in an estimated 41,033 overdose deaths involving opioids. We apply this adjustment uniformly over the age distribution of fatalities." The combination of that assumption with the methodology change resulted in a dramatically higher cost estimate than previous research had shows. According to the CEA, "CEA’s preferred cost estimate of $504.0 billion far exceeds estimates published elsewhere. Table 3 shows the cost estimates from several past studies of the cost of the opioid crisis, along with the ratio of the CEA estimate to each study’s estimate in 2015 dollars. Compared to the recent Florence et al. (2016) study—which estimated the cost of prescription opioid abuse in 2013—CEA’s preferred estimate is more than six times higher, reported in the table’s last column as the ratio of $504.0 billion to $79.9 billion, which is Florence et al.’s estimate adjusted to 2015 dollars. Even CEA’s low total cost estimate of $293.9 billion is 3.7 times higher than Florence et al.’s estimate." In contrast, the CEA noted that "Among the most recent (and largest) estimates was that produced by Florence et al. (2016), who estimated that prescription opioid overdose, abuse, and dependence in the United States in 2013 cost $78.5 billion. The authors found that 73 percent of this cost was attributed to nonfatal consequences, including healthcare spending, criminal justice costs and lost productivity due to addiction and incarceration. The remaining 27 percent was attributed to fatality costs consisting almost entirely of lost potential earnings." According to the CDC, there were 25,840 deaths in 2013 related to an opioid overdose. According to the CEA, "We also present cost estimates under three alternative VSL assumptions without age-adjustment: low ($5.4 million), middle ($9.6 million), and high ($13.4 million), values suggested by the U.S. DOT and similar to those used by HHS. For example, our low fatality cost estimate of $221.6 billion is the product of the adjusted number of fatalities, 41,033, and the VSL assumption of $5.4 million. Our fatality cost estimates thus range from a low of $221.6 billion to a high of $549.8 billion." "The Underestimated Cost of the Opioid Crisis," Council of Economic Advisers, Executive Office of the President of the United States, November 2017. Warner M, Trinidad JP, Bastian BA, et al. Drugs most frequently involved in drug overdose deaths: United States, 2010–2014. National vital statistics reports; vol 65 no 10. Hyattsville, MD: National Center for Health Statistics. 2016. Table B, p. 64. "This study found that the savings of supply-control programs are smaller than the control costs (an estimated 15 cents on the dollar for source-country control, 32 cents on the dollar for interdiction, and 52 cents on the dollar for domestic enforcement). In contrast, the savings of treatment programs are larger than the control costs; we estimate that the costs of crime and lost productivity are reduced by $7.46 for every dollar spend on treatment." Rydell, C.P. & Everingham, S.S., Controlling Cocaine, Prepared for the Office of National Drug Control Policy and the United States Army (Santa Monica, CA: Drug Policy Research Center, RAND Corporation, 1994), p. xvi. Click here for complete datatable for Estimated Federal Drug Control Spending By Function for Fiscal Years 2003-2017 including revisions by ONDCP for FY2009-FY2016. "National Drug Control Budget: FY 2016 Funding Highlights" (Washington, DC: Executive Office of the President, Office of National Drug Control Policy), February 2015, Table 3, p. 18. "FY2012 Budget and Performance Summary: Companion to the National Drug Control Strategy" (Washington, DC: Executive Office of the President, Office of National Drug Control Policy), April 2011, Table 3, p. 22. "This report estimates that legalizing drugs would save roughly $41.3 billion per year in government expenditure on enforcement of prohibition. Of these savings, $25.7 billion would accrue to state and local governments, while $15.6 billion would accrue to the federal government. Approximately $8.7 billion of the savings would result from legalization of marijuana and $32.6 billion from legalization of other drugs. "The report also estimates that drug legalization would yield tax revenue of $46.7 billion annually, assuming legal drugs were taxed at rates comparable to those on alcohol and tobacco. Approximately $8.7 billion of this revenue would result from legalization of marijuana and $38.0 billion from legalization of other drugs." Miron, Jeffey A., and Waldock, Katherine, "The Budgetary Impact of Ending Drug Prohibition," The Cato Institute (Washington, DC: Cato Institute, 2010). "Existing estimates about drug production and consumption are cryptic, inconsistent, and often impossible to verify. Apart from the series of studies titled What America’s Users Spend on Illegal Drugs that was produced in the 1990s under ONDCP’s auspices (see Rhodes, 1995, and Abt Associates, 2001) and the 1990s work of the Drug Availability Steering Committee (2002), many of the most-quoted estimates are not documented in a manner that allows others to assess their credibility, let alone replicate them. The large year-to-year changes in official estimates of consumption and particularly of production reduce their credibility, given the stable data on marijuana use in the U.S. population over the past decade. "While a number of estimates are described as being 'intelligence based' or are released by intelligence agencies, this does not mean we should automatically give them high credibility. This paper identifies a number of these estimates from national and international sources that are simply implausible. Drug-market estimation is a field plagued by a lack of data and heavily dependent on assumptions; thus, estimates from both intelligence and nonintelligence agencies need to be scrutinized. Policymakers would be well served by preventing the publication of figures without peer review. If the truth is that these figures are estimated imprecisely, that fact should be noted." Kilmer, Beau; Caulkins, Jonathan P.; Bond, Brittany M.; and Reuter, Peter H., "Reducing Drug Trafficking Revenues and Violence in Mexico: Would Legalizing Marijuana in California Help?" International Programs and Drug Policy Research Center (Santa Monica, CA: RAND Corporation, October 2010), p. 44. "Federal and state governments spent $3.3 trillion in 2005 to operate government and provide public services such as education, health care, income assistance, child welfare, mental health, law enforcement and justice services, transportation and highway safety. Hidden in this spending was a stunning $373.9 billion--11.2 percent--that was spent on tobacco, alcohol and other drug abuse and addiction. A conservative estimate of local government spending on substance abuse and addiction in 2005 is $93.8 billion. "The vast majority of federal and state substance related spending--95.6 percent or $357.4 billion--went to carry the burden to government programs of our failure to prevent and treat the problem while only 1.9 percent was spent on preventing or treating addiction. Another 0.4 percent was spent on research and the remaining two percent was spent on alcohol and tobacco tax collection, regulation and operation of state liquor stores (1.4 percent) federal drug interdiction (0.7 percent). For every dollar the federal and state governments spent on prevention and treatment, they spent $59.83 shoveling up the consequences. "A staggering 71.1 percent of total federal and state spending on the burden of addiction is in two areas: health and justice. Almost three fifths (58.0 percent) of federal and state spending on the burden of substance abuse and addiction (74.1 percent of the federal burden) is in the area of health care where untreated addiction causes or contributes to over 70 other diseases requiring hospitalization. The second largest area of substance-related federal and state burden spending is the justice system (13.1 percent)." National Center on Addiction and Substance Abuse at Columbia University, "Shoveling Up II: The Impact of Substance Abuse on State Budgets" (New York, NY: CASA, May 2009), pp. 1-2. "Almost half (47.3 percent) of government spending on substance abuse and addiction cannot be disaggregated by substance. In fact, research shows that most individuals who abuse or are dependent on addictive substances use more than one drug.9 Of the $248 billion in substance-related spending that can be linked to specific drugs of abuse, 92.3 percent is linked to the legal drugs of alcohol and tobacco." National Center on Addiction and Substance Abuse at Columbia University, "Shoveling Up II: The Impact of Substance Abuse on State Budgets" (New York, NY: CASA, May 2009), p. 16. " $16.4 billion in federal spending: $7.8 billion in dedicated drug enforcement, $39.5 million in drug court costs, $2.6 billion for drug interdiction, $2.5 billion for prevention, treatment, research and evaluation, and $3.8 billion in health care costs. " $1.9 billion in state spending: $336 million for public safety costs for drug enforcement programs, $138 million for drug courts, and $1.5 million linked to illicit and controlled prescription drugs in state spending on Medicaid. " $342.3 million in local health care spending." National Center on Addiction and Substance Abuse at Columbia University, "Shoveling Up II: The Impact of Substance Abuse on State Budgets" (New York, NY: CASA, May 2009), p. 17. " Workers with a college education had a lower prevalence of current illicit drug use compared with those without a college education. The prevalence of past month use of illicit drugs was lower among those with higher levels of education than those with less education (college graduate [5.7 percent] vs. less than high school [11.2 percent]) (Figure 2.6 and Table 2.3). " The prevalence of current illicit drug use was lower among workers with higher family incomes than among workers with lower family incomes. An estimated 13.2 percent of workers who reported family income that was less than $20,000 had used illicit drugs during the past month. In contrast, 6.0 percent of workers who reported income in the highest category––$75,000 or more––had used illicit drugs during the past month (Figure 2.7 and Table 2.3). " Residents of noncore counties had a lower prevalence of current illicit drug use (4.5 to 6.2 percent) compared with residents of micropolitan statistical area (7.1 percent), small metropolitan statistical area (MSA; 8.8 percent), and large MSA (8.3 percent) counties (Table 2.3)." Larson, S. L., Eyerman, J., Foster, M. S., & Gfroerer, J. C. (2007). Worker Substance Use and Workplace Policies and Programs (DHHS Publication No. SMA 07-4273, Analytic Series A-29). Rockville, MD: Substance Abuse and Mental Health Services Administration, Office of Applied Studies, pp. 12-15. "A more recent study using a demand-side approach estimates that the annual retail value of the U.S. methamphetamine market is between $3 and $8 billion, with a best guess of $5 billion.12 The margin of error is large because the footprint of methamphetamine use does not match the footprint of the data collection system. Methamphetamine use in the United States is concentrated in certain regions, and it is not primarily an urban drug, whereas data collection systems are centered in urban areas. Moreover, because there have been dramatic shifts in methamphetamine consumption and production during the past decade, estimates are highly dependent on the year analyzed. While there are considerable uncertainties, the amphetamine market is clearly smaller than the cocaine and cannabis markets in North America, smaller than the cocaine market in South America, and potentially smaller than markets for other drugs elsewhere in the hemisphere as well. However, data are not available to provide a detailed analysis for all regions." Organization of American States, "The Drug Problem in the Americas: Studies: Chapter 4: The Economics of Drug Trafficking," 2013, p. 12. "In 2005, the federal government spent $2.6 billion to disrupt and deter the transport of illicit drugs into the United States. While international efforts to step up drug seizures may affect availability, price and consequences associated with a particular drug (i.e., cocaine or heroin), CASA was unable to find evidence that such strategies have an overall impact on reducing substance abuse and addiction or its costs to government." National Center on Addiction and Substance Abuse at Columbia University, "Shoveling Up II: The Impact of Substance Abuse on State Budgets" (New York, NY: CASA, May 2009), p. 58. " Drug users in the United States spend on the order of $100 billion annually on cocaine, heroin, marijuana, and meth. While this total figure has been stable over the decade, there have been important compositional shifts. In 2000, much more money was spent on cocaine than marijuana; in 2010 the opposite was true. " Heroin consumption remained fairly stable throughout the decade, although there is some evidence of an increase in the later years. Most of the heroin consumed in the United States comes from poppies grown in Colombia and Mexico, but data deficiencies surrounding associated production figures from 2005 to 2010 make comparisons difficult. There was a steady increase in the amount of heroin seized within the United States and at the southwest border from 2007 through 2010. " Methamphetamine estimates are subject to the greatest uncertainty because national datasets do not do a good job of capturing its use. Three particular challenges were that the Arrestee Drug Abuse Monitoring Program (ADAM-I) was discontinued in 2003, just before meth use was believed to be at its peak (2004–2006); ADAM-II did not start until 2007 (2007–2010) and it covers very few counties with substantial meth use; and the National Survey on Drug Use and Health (NSDUH) changed how it asked about meth use in 2007. While multiple indicators are consistent with an increasing trend in meth consumption over the first half of the decade and a subsequent decline through 2008, there is not comparable agreement as to the level. Further, we suggest that the most defensible position concerning trends from 2008 to 2010 is simply to admit the data are insufficient to provide clear guidance. " For all of the drugs, total consumption and expenditures are driven by the minority of heavy users, who consume on 21 or more days each month." B. Kilmer, S. Everingham, J. Caulkins, G. Midgette, R. Pacula, P. Reuter, R. Burns, B. Han, R. Lundberg, "What America’s Users Spend on Illegal Drugs: 2000-2010," Prepared for:Office of National Drug Control Policy Office of Research and Data Analysis Under HHS contract number: HHSP23320095649WC, Feb. 2014, pp. 3-4. "In 2007, the cost of illicit drug use totaled more than $193 billion. Direct and indirect costs attributable to illicit drug use are estimated in three principal areas: crime, health, and productivity. "• Crime includes three components: criminal justice system costs ($56,373,254,000), crime victim costs ($1,455,555,000), and other crime costs ($3,547,885,000). These subtotal $61,376,694,000. "• Health includes five components: specialty treatment costs ($3,723,338,000), hospital and emergency department costs for nonhomicide cases ($5,684,248,000), hospital and emergency department costs for homicide cases ($12,938,000), insurance administration costs ($544,000), and other health costs ($1,995,164,000). These subtotal $11,416,232,000. "• Productivity includes seven components: labor participation costs ($49,237,777,000), specialty treatment costs for services provided at the state level ($2,828,207,000), specialty treatment costs for services provided at the federal level ($44,830,000), hospitalization costs ($287,260,000), incarceration costs ($48,121,949,000), premature mortality costs (nonhomicide: $16,005,008,000), and premature mortality costs (homicide: $3,778,973,000). These subtotal $120,304,004. "Taken together, these costs total $193,096,930,000, with the majority share attributable to lost productivity." "The Economic Impact of Illicit Drug Use on American Society," National Drug Intelligence Center (Washington, DC: United States Department of Justice, April 2011), p. ix-xi. "The narcotics trade has also significantly impeded fiscal growth and stability by diverting scarce resources away from more-productive uses. Between 1981 and 2008, federal, state, and local governments are estimated to have spent at least $600 billion (adjusted for inflation) on drug interdiction and related law enforcement efforts; factoring in costs associated with treatment and rehabilitation, the overall total rises to around $800 billion.34 If one were to also add in 'invisible' losses brought about by curtailed job opportunities and reduced workplace productivity, the true cost would be far higher." Chalk, Peter, "The Latin American Drug Trade: Scope, Dimensions, Impact, and Response," RAND Corporation for the United States Air Force (Santa Monica, CA: 2011), p. 47. "In 2010, state expenditures totaled $1.9 trillion dollars while state spending on corrections was $48.5 billion. Between fiscal years 1982 and 2010, spending on corrections represented between 1.9% and 3.3% of total expenditures by state governments. Since 2003, corrections expenditures, as a share of total spending, fluctuated between 2.5% and 2.9% of state expenditures (figure 1). "Between 1982 and 2010, spending on education varied between 29% and 33% of total state expenditures, spending on public welfare varied between 22% and 25%, spending on highways varied between 5.7% and 8.6%, and spending on health care and hospitals varied between 6.2% and 7.5%. Other expenditures (including air transportation, financial administration, police protection, and public safety expenditures) ranged between 29% and 32% of state expenditures." Kyckelhahn, Tracey, "State Corrections Expenditures, FY 1982-2010" (Washington, DC: US Dept. of Justice Bureau of Justice Statistics, Dec. 2012), NCJ239672, p. 1. "In fiscal 2015, corrections spending represented 3.1 percent of total state spending and 6.8 percent of general fund spending. General fund dollars are the primary source for state corrections and accounted for $50.9 billion, or 89.5 percent, of all fiscal 2015 state corrections spending. State funds (general funds and other state funds combined, but excluding bonds) accounted for 97.7 percent of total state corrections spending in fiscal 2015. Federal funds accounted for 1.2 percent and bonds accounted for 1.0 percent." National Association of State Budget Officers (NASBO), "State Expenditure Report: Examining Fiscal 2014-2016 State Spending," (Washington, DC: NASBO, 2016), p. 54. "State spending on corrections reflects the costs to build and operate prison systems and may include spending on juvenile justice systems and my include spending on juvenile justice programs and alternatives to incarceration such as probation and parole. State spending for corrections totaled $56.9 billion in fiscal 2015, compared to $55.3 billion in fiscal 2014, a 3.0 percent increase in total spending with state funds increasing 3.1 percent and federal funds declining 1.4 percent. State spending on corrections in fiscal 2016 is estimated to total $58.0 billion, a 2.0 percent increase from fiscal 2015. State funds are estimated to increase by 2.1 percent, while federal funds are estimated to increase by 3.6 percent. "Although state spending on corrections is estimated to increase for fiscal 2016, the growth rate has slowed. For several years states have been making criminal justice reforms to address the cost drivers of corrections expenditures, including limiting growth in inmate populations. Many states are examining their criminal justice systems and implementing reforms to concentrate resources on the most violent offenders while ensuring other offenders are equipped with the tools and supports needed to successfully transition back to the community. These reforms include alternatives to incarceration, earning sentence credits for good behavior, other sentencing changes, parole reforms, and increased treatment to address mental health and substance abuse disorders. And while several states have been successful in reducing the growth of their inmate population, costs continue to increase due to programming investments, increasing inmate health care expenditures, costly maintenance of aging facilities, and the personnel costs associated with running institutions." from $9.9 billion to $52.4 billion (without adjusting for inflation).19 By comparison, total spending from state funds increased by 315 percent over the same time period. remained more stable due to the rise in earmarked funds or trust funds in other program areas besides corrections that designate revenues for specific purposes set by statute. For example, higher education derives much of its state funding from designated revenue streams outside the general fund. To some extent, this trend may have insulated other program areas from budgetary pressures related to increased general fund spending for corrections." "State Spending for Corrections: Long-Term Trends and Recent Criminal Justice Policy Reforms," National Association of State Budget Officers (Washington, DC: NASBO, Sept. 11, 2013), p. 4. According to the federal Bureau of Justice Statistics, in 2010, state corrections institutions spent $37.3 billion to imprison a total of 1,316,858 inmates. BJS estimates that the mean expenditures per capita was $28,323. There was a wide range in state spending: the bottom 25th percentile averaged only $21,417, the 50th percentile averaged $29,094, and the 75th percentile averaged $40,175. Kyckelhahn, Tracey, "State Corrections Expenditures, FY 1982-2010" (Washington, DC: US Dept. of Justice Bureau of Justice Statistics, Dec. 2012), NCJ239672, Table 2, p. 4. " The federal government spent $238.2 billion on substance abuse and addiction or 9.6 percent of the federal budget. If substance abuse and addiction were its own budget category, it would rank sixth in size--behind social security, national defense, income security, Medicare and other health programs. " State governments, including the District of Columbia and Puerto Rico, spent 15.7 percent of their budgets ($135.8 billion) to deal with substance abuse and addiction--up from 13.3 percent in 1998. If substance abuse and addiction were its own budget category, it would rank second behind elementary and secondary education. States spend more on substance abuse and addiction than they spend on Medicaid, higher education, transportation or justice. " Local governments spent conservatively $93.8 billion on substance abuse and addiction or 9.0 percent of local budgets, outstripping local spending for transportation and public welfare." National Center on Addiction and Substance Abuse at Columbia University, "Shoveling Up II: The Impact of Substance Abuse on State Budgets" (New York, NY: CASA, May 2009), p. 2. "Despite the demonstrated successes of criminal justice reforms, cost savings have yet to produce an overall decline in corrections spending. However, the policy reforms are improving the way states spend money for corrections, and the outcomes show better results for individuals and citizens. Over time, the cost savings from smart, criminal justice polices may lead to correctional spending declines, an outcome that would benefit all of state government." "State Spending for Corrections: Long-Term Trends and Recent Criminal Justice Policy Reforms," National Association of State Budget Officers (Washington, DC: NASBO, Sept. 11, 2013), p. 5. "Only 2.4 percent of total federal and state substance-related spending in 2005 ($8.8 billion) was for prevention, treatment or research; only 1.9 percent ($7.2 billion) was for prevention and treatment. (Table 6.1) For every dollar federal and state governments spend to prevent and treat substance abuse and addiction, they spend $59.83 in public programs shoveling up its wreckage, despite a substantial and growing body of scientific evidence confirming the efficacy of science-based interventions and their enormous cost-saving potential." National Center on Addiction and Substance Abuse at Columbia University, "Shoveling Up II: The Impact of Substance Abuse on State Budgets" (New York, NY: CASA, May 2009), p. 45. "State spending for corrections increased from $65 per resident in 1986 to $134 in 2001 (table 1). Per capita expenditures for State prison operations alone rose from $49 in 1986 to $104 in 2001. "At an average annual increase of 6.2% for total State correctional spending and 6.4% specifically for prisons, increases in the cost of adult incarceration outpaced those of health care (5.8%), education (4.2%), and natural resources (3.3%). "Although correctional spending grew at a faster rate than many other State boards and programs (including court payments between 1986 and 2001, it remained one of the smaller cost items. For example, the outlay for education, at $374.5 billion, was nearly 10 times larger, and that for welfare, at $260.3 billion, was nearly 7 times larger." Stephan, James J., "State Prison Expenditures, 2001," Bureau of Justice Statistics (Washington, DC: US Department of Justice, June, 2004), NCJ202949, p. 2. "Substance abuse treatment is more cost-effective than prison or other punitive measures. The Washington State Institute for Public Policy (WSIPP) found that drug treatment conducted within the community is extremely beneficial in terms of cost, especially compared to prison. Every dollar spent on drug treatment in the community is estimated to return $18.52 in benefits to society." Justice Policy Institute, "Substance Abuse Treatment and Public Safety," (Washington, DC: January 2008), p. 2. "Retail sales of imported hemp products exceeded $70 million in the United States in 2006.62 Given hemp’s wide-ranging utility, supporters of domestic cultivation estimate that it would create a $300 million dollar industry.63"
Kolosov, Christine A., "Evaluating the Public Interest: Regulation of Industrial Hemp under the Controlled Substances Act," UCLA Law Review (Los Angeles, CA: UCLA School of Law, 2009), p. 244. "In 2007, there were 1,922 arrests for first-time marijuana possession in Rhode Island. In 2008, there were 584 incidents of incarceration for marijuana possession.1 Ending prohibition and eliminating these arrests would save the state approximately $12.7 million in criminal justice costs." Opendoors, "The Criminal Justice Costs of Marijuana Prohibition in Rhode Island," (Providence, RI: March 2010), p. 1. "The expenditures noted reflect the cost of installing intercept devices and monitoring communications for the 2,034 authorizations for which reports included cost data. The average cost of intercept devices in 2011 was $49,629, down 1 percent from the average cost in 2010. For federal wiretaps for which expenses were reported in 2011, the average cost was $71,748, a 13 percent increase from 2010. The cost of a state wiretap ranged from a low of $200 in Hudson County, New Jersey, to a high of $2,885,712 for a narcotics investigation conducted by the New York Organized Crime Task Force." Administrative Office of the United States Courts, 2011 Wiretap Report (Washington, DC: USGPO, June 2012), p. 9. "In 2003 the United States spent a record $185 billion for police protection, corrections, and judicial and legal activities. Expenditures for operating the Nation's justice system increased from almost $36 billion in 1982 to over $185 billion in 2003, an increase of 418%"
Hughes, Kristen A., "Justice Expenditure and Employment in the United States, 2003" (Washington, DC: US Dept. of Justice, Bureau of Justice Statistics, April 2006), NCJ212260, p. 2. "• Overall, local police spending represented 45% of the Nation's total justice expenditure, and State corrections accounted for the second largest portion, 33%. "• Police protection is primarily a local responsibility; accordingly, local governments spent 69% of the total police protection expenditure in the country in 2003. "• Corrections is primarily a State responsibility; as such State governments accounted for 64% of the Nation's corrections expenditure. "• Judicial and legal services in the United States were funded primarily by local (43%) and State (38%) governments." Hughes, Kristen A., "Justice Expenditure and Employment in the United States, 2003" (Washington, DC: US Dept. of Justice, Bureau of Justice Statistics, April 2006), NCJ212260, p. 4. "Mexico is a major drug producing and transit country. Proceeds from the illicit drug trade leaving the United States are the principal source of funds laundered through the Mexican financial system. Other significant sources of illegal proceeds being laundered include corruption, kidnapping, extortion, piracy, human trafficking, and trafficking in firearms. Sophisticated and well-organized drug trafficking organizations based in Mexico take advantage of the extensive U.S.-Mexico border, the large flow of legitimate remittances, Mexico’s proximity to Central American countries, and the high volume of legal commerce to conceal transfers to Mexico. The smuggling of bulk shipments of U.S. currency into Mexico and the repatriation of the funds into the United States via couriers or armored vehicles, trade, and wire transfers remain favored methods for laundering drug proceeds. Though the combination of a sophisticated financial sector and a large cash-based informal sector complicates the problem, the 2010 implementation of U.S. dollar deposit restrictions reduced the amount of bulk cash repatriation back to the United States via the formal financial sector by approximately 70 percent, or $10 billion. According to U.S. authorities, drug trafficking organizations send between $19 and $29 billion annually to Mexico from the United States, though the Government of Mexico disputes this figure. Since 2002, Mexico has seized a total of more than $500 million in bulk currency shipments." "International Narcotics Control Strategy Report: Volume II, Money Laundering and Financial Crimes" (Washington, DC: US Dept. of State Bureau for International Narcotics and Law Enforcement Affairs, March 2014), pp. 161-162. "The report estimates that legalizing drugs would save roughly $48.7 billion per year in government expenditure on enforcement of prohibition. $33.1 billion of this savings would accrue to state and local governments, while $15.6 billion would accrue to the federal government. Approximately $13.7 billion of the savings would results from legalization of marijuana, $22.3 billion from legalization of cocaine and heroin, and $12.8 from legalization of other drugs." Miron, Jeffey A., PhD, "The Budgetary Implications of Drug Prohibition," (February, 2010), p. 1. "Domestic enforcement costs 4 times as much as treatment for a given amount of user reduction, 7 times as much for consumption reduction, and 15 times as much for societal cost reduction." "In summary, prices for powder cocaine, crack, and heroin declined sharply in the 1980s and have declined more gradually since then, with periodic interruptions by modest price spikes that have usually persisted for a year or less. For d-methamphetamine, the pattern is broadly similar, but the price spikes appear to be larger and longer-lasting, particularly for 1989–1991. Marijuana prices have followed a very different pattern, increasing from 1981 to 1991, then declining through 2000 and increasing over the past three years." Office of National Drug Control Policy, "The Price and Purity of Illicit Drugs: 1981 Through the Second Quarter of 2003" (Washington DC: Executive Office of the President, November 2004), Publication Number NCJ 207768, p. vii. "Economic analysis can be an important tool for policy evaluation, although the limited information available on drug-related public expenditure in Europe represents a major obstacle and makes comparison between countries difficult. For the 16 countries that have produced estimates since 2002, drug-related public expenditure ranges from 0.01% to 0.5% of their gross domestic product (GDP). From the information available, it appears that the largest share of drug-related public expenditure is allocated to drug supply reduction activities (Figure 4.4). "Public expenditure on supply reduction includes, among other things, expenditure on drug-law offenders in prisons. The EMCDDA calculated a range of estimates, where the low estimate considers only those prisoners who have been sentenced for a drug-law offence and the high estimate also includes pre-trial prisoners who may be sentenced for a drug-law offence. Applying these criteria, European countries spent an estimated 0.03% of GDP, or EUR 3.7 billion, on drug-law offenders in prison in 2010. Including pre-trial prisoners, the estimate rises to 0.05% of GDP or EUR 5.9 billion." European Monitoring Centre on Drugs and Drug Addiction, "European Drug Report 2014: Trends and Developments" (Lisbon, Portugal: EMCDDA, 2014), p. 70. "In 2003, 7.2% of total State and local expenditures was for justice activities – 3% for police protection, 2.6% for corrections, and 1.5% for judicial and legal services (figure 3). "By comparison, 29% of State and local government spending went to education, 14% to public welfare, 7% to health and hospitals, and 4% to interest on debt." "The most recent figures available from the Office of National Drug Control Policy (ONDCP) indicate that, in 1999, federal expenditures on control of illegal drugs surpassed $17 billion; combined expenditures by federal, state, and local governments exceeded $30 billion. What is more, the nation's so-called 'drug war' is a protracted one. The country has spent roughly this amount annually throughout the 1990s." National Research Council, National Academy of Sciences, "Informing America's Policy on Illegal Drugs: What We Don't Know Keeps Hurting Us" (Washington, DC: National Academy Press, 2001), p. 1. "• Mexican DTOs’ gross revenues from moving marijuana across the border into the United States and selling it to wholesalers is likely less than $2 billion, and our preferred estimate is closer to $1.5 billion. This figure does not include revenue from DTO production and distribution in the United States, which is extremely difficult to estimate with existing data. "• The ubiquitous claim that 60 percent of Mexican DTO export revenues come from U.S. marijuana consumption (Fainaru and Booth, 2009; Yes on 19, undated) should not be taken seriously. No publicly available source verifies or explains this figure and subsequent analyses revealed great uncertainty about the estimate (GAO, 2007). Our analysis— though preliminary on this point—suggests that 15–26 percent is a more credible range of the share of drug export revenues attributable to marijuana." Kilmer, Beau; Caulkins, Jonathan P.; Bond, Brittany M.; and Reuter, Peter H., "Reducing Drug Trafficking Revenues and Violence in Mexico: Would Legalizing Marijuana in California Help?" International Programs and Drug Policy Research Center (Santa Monica, CA: RAND Corporation, October 2010), p. 3. (Costs of Juvenile Justice System) "Approximately 93,000 young people are held in juvenile justice facilities across the United States.1 Seventy percent of these youth are held in state-funded, post adjudication, residential facilities, at an average cost of $240.99 per day per youth.2"
Justice Policy Institute, "The Costs of Confinement: Why Good Juvenile Justice Policies Make Good Fiscal Sense," (Washington, DC: May 2009), p. 1. "However, during fiscal years 2000-2005, the United States provided about $6.2 billion to support counternarcotics and related programs in the source and transit zones (see table 1).12 In the source zone, U.S. assistance supports eradication and interdiction efforts and related programs for alternative development and judicial reform, primarily in Bolivia, Colombia, and Peru. In the transit zone, the United States provided about $365 million in assistance—primarily to El Salvador, Guatemala, Haiti, and Mexico —to support interdiction and other law enforcement programs." "For fiscal year 2006, the Administration has requested an additional $735 million for countries in the source zone and $77 million for countries in the transit zone." "From fiscal year 2000 through 2005, the United States provided about $365 million in assistance to countries in the transit zone. Of this, Mexico received approximately $115 million to support its efforts to eradicate opium poppy and marijuana, and improve surveillance and intelligence capabilities." "Drug Control: Agencies Need to Plan for Likely Decline in Drug Interdiction Assets, and Develop Better Performance Measures for Transit Zone Operations," Government Accountability Office (Washington, DC: USGAO, Nov. 2005), GAO-06-200, pp. 10 and 23. "Correctional authorities spent $38.2 billion to maintain the Nation? 's State correctional systems in fiscal year 2001, including $29.5 billion specifically for adult correctional facilities. Day-to-day operating expenses totaled $28.4 billion, and capital outlays for land, new building, and renovations, $1.1 billion. "The average annual operating cost per State inmate in 2001 was $22,650, or $62.05 per day. Among facilities operated by the Federal Bureau of Prisons, it was $22,632 per inmate, or $62.01 per day." Stephan, James J., "State Prison Expenditures, 2001," Bureau of Justice Statistics (Washington, DC: US Department of Justice, June, 2004), p. 1. Jeremy Haken, "Transnational Crime in the Developing World" (Washington, DC: Global Financial Integrity/Center for International Policy, Feb. 2011), p. 3. "If only flows related to drug trafficking and other transnational organized crime activities were considered, related proceeds would have been equivalent to around US$650 billion per year in the first decade of the new millennium, equivalent to 1.5% of global GDP or US$870 billion in 2009 assuming that the proportions remained unchanged. The funds available for laundering through the financial system would have been equivalent to some 1% of global GDP or US$580 billion in 2009. "The largest income for transnational organized crime comes from illicit drugs, which account for some 20% (17%-25%) of all crime proceeds, about half of transnational organized crime proceeds and 0.6% to 0.9% of global GDP. In turn, drug-related proceeds available for money-laundering through the financial system would be equivalent to between 0.4% and 0.6% of global GDP." UN Office on Drugs and Crime, "Estimating Illicit Financial Flows Resulting from Drug Trafficking and Other Transnational Organized Crimes," Oct. 2011, p. 7. " While estimating the size of global and hemispheric drug markets presents tremendous challenges, evidence suggests that some two thirds of total revenues are earned at the final, retail level in consuming countries. " Wholesalers and traffickers through transit countries account for another 20-25 percent of revenues, while just under 1 percent of total retail sales finds its way to drug cultivators in the Andes." Organization of American States, "The Drug Problem in the Americas: Studies: Chapter 4: The Economics of Drug Trafficking," 2013, p. 5. "Markups in the illicit drug trade are orders of magnitude higher than markups for legal goods. For example, coffee beans cost around five times more at retail than at farm gate, whereas heroin costs around 170 times more.46 Markups are higher for a number of reasons: participants must be compensated for the risks of incarceration and violence, prohibition reduces the efficiency of production and distribution, the supply chain is long with a large number of middlemen, and some participants have substantial market power. On the production side, the illicit nature of the drug trade reduces efficiency, as drug cultivation must be concealed, transport may not take direct routes and requires extensive bribes, and a drug dealer typically handles far fewer transactions per day than a pharmacist or grocer. Finally, at certain segments of the supply chain, participants may exercise significant market power through controlling trafficking routes or consumer markets. The fact that they face at most limited competition allows them to set higher prices. "For many drugs, especially those that are plant-based, markups could fall substantially if the substances were produced, transported, and distributed like other commercial goods. Using reasonable assumptions about the cost of transport and retail markups under a commercialized regime, one 2012 study calculates that the price of cocaine (prior to any taxation or fees) could fall 96 percent, from about $66 to $2.78 per gram at 63 percent purity, and retail heroin prices could fall by 98 percent, from about $140 to $3 per gram at 55 percent purity.47 For marijuana, a recent study calculates that if high-potency marijuana could be legally cultivated in large grow houses (at $200-$400 per pound), the retail price per ounce could fall by more than 80 percent.48 If plants could be cultivated in large outdoor fields, the same study estimates that the price decline would be even greater, albeit for a less potent substance. These same studies do not take into account the impact of any taxation or other administrative fees that could be imposed to raise retail prices closer to previous levels." Organization of American States, "The Drug Problem in the Americas: Studies: Chapter 4: The Economics of Drug Trafficking," 2013, p. 23. "The global opiate market was valued at US$68 billion in 2009, with heroin consumers contributing US$61 billion. The value of the world heroin market tends to increase according to the number of international borders crossed by traffickers. That is, heroin is generally cheaper in Afghanistan, a production country, than in West and Central Europe, where the drugs have been transported by various means across long distances and changed hands a number of times. However, this pattern can be deceptive, as heroin prices and consumption levels vary significantly across countries and regions. "Heroin prices fluctuate significantly across the globe, and Australia is the starkest example of global price variation. Although Australian users represent just 0.85% of total global heroin consumption, they contribute 4% of the global market value. The street value per gram of heroin is between US$230–370 in Australia whereas one gram of heroin was worth around US$170-200 in the USA and northern Europe, and consumers in West and Central Europe paid US$40-100 per gram. Overall, the Russian Federation and West and Central Europe contributed almost half of the total global market value, accounting for US$31 billion in 2009." UNODC, World Drug Report 2011 (United Nations Publication, Sales No. E.11.XI.10), p. 83. "Of the US$ 65 billion turnover of the global market for opiates, only 5-10 per cent (US$ 3-5 billion) are estimated to be laundered by informal banking systems. The rest is laundered through legal trade activities (including smuggling of legal goods into Afghanistan) and the banking system." United Nations Office on Drugs and Crime, "Addiction, Crime and Insurgency: The transnational threat of Afghan opium" (Vienna, Austria: October 2009), p. 7. "In 2008, of the $35 billion U.S. cocaine market, for example, coca farmers in the developing source countries made about $500 million. This equates to 1.4 percent of gross profits. Traffickers within the source countries then made approximately $400 million (one percent), followed by international traffickers (i.e. Mexican drug cartels) who made $4.6 billion (13 percent).25 When added together, only 15 percent ($5.4 billion) of the $35 billion retail value was made in developing source or transit countries. This means that $29.6 billion was generated after the drugs entered the United States." Haken, Jeremy, "Transnational Crime In The Developing World," Global Financial Integrity (Washington, DC: Center for International Policy, February 2011), p. 5. "In 2006 a team of researchers published estimates of the social costs of substance abuse in Canada across several domains based on 2002 data (Rehm et al., 2006). Total costs of substance abuse for all substances (including tobacco) were estimated to be $39.8 billion in 2002, which translates into $1,267 per capita. Of this, approximately 39% are direct costs to the economy associated with health care, enforcement, prevention/research and 'other costs'6, and 61% are indirect costs associated mainly with productivity losses resulting from premature death and disability. Figure 2 depicts the estimated direct social costs associated with alcohol, illicit drugs and cannabis in 2002. "Important findings from Figure 2 include the fact that (1) total direct social costs associated with alcohol ($7,427.5 million) are more than double those for all illicit drugs combined ($3,565.5 million); (2) direct alcohol-related health care costs ($3,306.2 million) are nearly three times as high as for all illicit drugs, excluding cannabis ($1,061.6 million), and over 45 times higher than the direct health care costs of cannabis ($73 million); and (3) annual direct costs for health care ($4,440.7 million) are 31 times higher, and annual direct costs for enforcement ($5,407.7 million) are 36 times higher than annual costs for prevention and research ($147.6 million)." Thomas, Gerald and Davis, Christopher G., Comparing the Perceived Seriousness and Actual Costs of Substance Abuse in Canada: Analysis drawn from the 2004 Canadian Addiction Survey," Canadian Centre on Substance Abuse (Ottawa, ON: Canadian Centre on Substance Abuse, March 2007), pp. 2-4. "The global illicit flow of goods, guns, people, and natural resources is estimated at approximately $650 billion. Though data is scarce and experts are constantly debating the relative merits and weaknesses of every new study, it is generally accepted that illicit drug trafficking and counterfeiting are the two most valuable markets. This report finds the illicit drug trade to be worth roughly $320 billion and counterfeiting $250 billion." Haken, Jeremy, "Transnational Crime In The Developing World," Global Financial Integrity (Washington, DC: Center for International Policy, February 2011), p. v.
"In 2011, the estimated potential opium production amounted to 5,800 mt, an increase by 61% over 2010. As opium cultivation remained relatively stable between 2009 and 2011, the differences in opium production in those years were due to changes in per-hectare opium yield. 2009 was a year with high opium yields (56.1 kg/ha), while in 2010, major opium cultivation areas were affected by plant diseases, which led to a strong yield reduction (29.2 kg/ha). In 2011, opium yields were back to “normal” levels of 44.5 kg/ha. In 2011, the Southern region continued to produce most opium in Afghanistan, representing 85% of national production, followed by the Western region (12%)." "Afghanistan Opium Survey 2011," United Nations Office on Drugs and Crime (Vienna, Austria: United Nations, October 2011), p. 13. (UN Estimate of Value of Global Illicit Drug Market) "If compared to global licit exports (US$7,503 bn in 2003) or compared to global GDP (US$35,765 bn in 2003) the estimated size [of] the global illicit drug market may not appear to be particularly high (0.9% of global GDP at retail level or 1.3% of global exports measures at wholesale level). "Nonetheless, the size of the global illicit drug market is substantial. The value, measured at retail prices, is higher than the GDP of 88% of the countries in the world (163 out of 184 for which the World Bank has GDP data) and equivalent to about three quarters of Sub-Saharan Africa's combined GDP (US$439 bn in 2003). The sale of drugs, measured at wholesale prices, was equivalent to 12% of global export of chemicals (US$794 bn), 14% of global agricultural exports (US$674 bn) and exceeded global exports of ores and other minerals (US$79 bn) in 2003. Such sales of drugs were also higher than the combined total licit agricultural exports from Latin America (US$75 bn) and the Middle East (US$10 bn) in 2003." United Nations Office on Drugs and Crime (UNODC), World Drug Report 2005 (Vienna, Austria: UNODC, June 2005), p. 127. "The UNODC (2005) estimates that the world retail market for cannabis was about €125 Billion4 circa 2003; more than the retail markets for cocaine and opiates combined. The US is believed to be the largest contributor to this estimate, but the exact size of that market is far from settled. Indeed, some of the estimates of the US market vary by a factor of 10. Beau Kilmer, Rosalie Liccardo Pacula, "Estimating the size of the global drug market: A demand-side approach," Prepared for the Euopean Commission (The RAND Corporation, 2009) p. 8. "Based on the inputs and the calculations explained above, the value of the global illicit drug market for the year 2003 was estimated at US$13 bn [billion] at the production level, at $94 bn at the wholesale level (taking seizures into account), and at US$322bn based on retail prices and taking seizures and other losses into account. This indicates that despite seizures and losses, the value of the drugs increase substantially as they move from producer to consumer. "The largest market, according to these estimates, is cannabis herb (with a retail market size of $113 bn), followed by cocaine (US$71 bn), the opiates (US$65bn) and cannabis resin (US$29 bn). The ATS markets together (methamphetamine, amphetamine and ecstasy) amount to US$44 bn. The valuation does not take into account the value of other drugs." (Value of Illegal Drug Exports from the Caribbean) "The value of illegal drug exports from the Caribbean during the past two decades has fallen into two very well differentiated periods. The first period, from 1981 to 1990, was an epoch of impressive depression in the total value of the Caribbean drugs exports -- from an income over US$20bn at its peak in 1983 to US$5bn in 1991. Since 1991, the value of Caribbean exports of illegal drugs has stabilised around US$5bn." "The Value Of Illegal Drug Exports Transiting The Caribbean - 1981-2000," United Nations Office on Drugs and Crime, Caribbean Regional Office, February 2004, p. 39. (Estimates of Size of the World Illegal Drug Market) "It is also worth noting that by 1999, the UNDCP had not attempted to follow up its efforts to estimate the size of the world illegal drug market. That year, the Financial Action Task Force (FATF) [an inter-governmental body focusing on anti-money laundering activities and legislation] decided to begin work to assess the size of the world illegal economy and found it convenient to start with an estimate of the illegal drug market, a task that was considered easier than estimating other illegal activities, given the large work on drugs already available. FATF hired Peter Reuter, a well-known economist who has done extensive work on illegal drug markets, and produced an estimate. This job had the full cooperation of the UNDCP, which opened its data bank to the researcher. "The resulting study is probably the most serious attempt to ascertain the size of the world illegal drug market and resulted in an estimated range between $45 and $280 billion." Francisco E. Thoumi, "Let’s All Guess the Size of the Illegal Drugs Industry!" Transnational Institute (Amsterdam, The Netherlands: December 2003), p. 7. "In 2011, opium prices had reached high levels as a result of the unusually low opium production in 2010, when major cultivation areas were affected by plant diseases. "Results from the 2009 opium survey indicated that the low opium price level in that year discouraged farmers from planting opium. However, since then, opium prices have tripled. The high sale price of opium in combination with lower wheat prices may have encouraged famers to resume opium cultivation. The high level of opium prices in 2011 continues to provide a strong incentive to plant opium in the upcoming poppy season." "Afghanistan Opium Survey 2011," United Nations Office on Drugs and Crime (Vienna, Austria: United Nations, October 2011), p. 19. "When the Taliban were in power (in the late 1990s) they extracted US$ 75-100 million a year from taxing opium. In the 2005-2008 period the cumulative revenue from opiate farming and trade accruing to Taliban insurgents is estimated at US$ 350-650 million, or an annual average of US$ 90-160 million in Afghanistan alone. This estimate does not include insurgents’ potential revenues from other drug-related activities (labs, imports of precursors) in Afghanistan and from the US$1 billion opiate trade in Pakistan." (US Counternarcotics Spending in Afghanistan) "The U.S. Government has been involved in counternarcotics in Afghanistan for over 20 years through various agreements to suppress the production, distribution, and use of illicit drugs and has spent approximately $2 billion on counternarcotics programs in the last 5 years." United States Department of State and the Broadcasting Board of Governors Office of Inspector General, Middle East Regional Office, "Status of the Bureau of International Narcotics and Law Enforcement Affairs Counternarcotics Programs in Afghanistan Performance Audit," Report Number MERO-A-10-02 (Washington, DC: U.S. Department of State: December 2009), p. 3. "The long-run elasticities provide a basis for estimating potential benefits from changing the current policy mix away from enforcement and interdiction and towards education and treatment. Applying the estimated coefficients, a 10 percent reduction in expenditures on enforcement (about 1 billion dollars by the late 1990s) would be associated with a long-run reduction of over 20% in both the number of deaths and the age-adjusted death rate. This would imply that close to 3,000 deaths a year might be avoided with a shift away from enforcement approaches to drug control. Adding the billion dollars to education and treatment would represent an 18% increase in 1998. The estimated elasticity of 1.59 implies a reduction of close to 5,000 drug-induced deaths per year as a result. Thus, the underlying estimates suggest that very substantial improvements in public health may be achieved by emphasizing education and treatment over enforcement and interdiction." Shepard, Edward & Paul R. Blackley, "US Drug Control Policies: Federal Spending on Law Enforcement Versus Treatment in Public Health Outcomes," Journal of Drug Issues, Vol. 34, No. 4, Fall 2004, pp. 781-782. "When the price of an illicit drug changes, the quantity consumed by existing users may change and the total number of users may also respond. The percentage change in total consumption resulting from a 1 percent change in price is referred to as the demand elasticity. For cocaine and cannabis, the elasticity of demand has been estimated at around -0.5, indicating that demand falls by 0.5 percent when price increases by 1 percent.15 This elasticity is similar to that observed for tobacco and implies that a price increase more than compensates for the reduction in demand and results in higher overall drug revenues. There are fewer studies for heroin, but a reasonable estimate for elasticity appears to be around -0.3.16 For methamphetamine, a successful U.S. government effort to reduce the supply of precursor chemicals led the price of the drug to temporarily triple and the purity to decline from 90 percent to 20 percent.17 Simultaneously, amphetamine-related hospital admissions dropped by 50 percent, and use among arrestees declined by 55 percent. However, these indicators returned to their previous levels within four months as prices fell and purity increased." Organization of American States, "The Drug Problem in the Americas: Studies: Chapter 4: The Economics of Drug Trafficking," 2013, pp. 12-13. "Our estimates suggest that ex-offenders lower overall employment rates as much as 0.8 to 0.9 percentage points; male employment rates, as much as 1.5 to 1.7 percentage points; and those of less-educated men as much as 6.1 to 6.9 percentage points. These employment losses hit ex-offenders hardest, but also impose a substantial cost on the U.S. economy in the form of lost output of goods and services. In GDP terms, we estimate that in 2008 these employment losses cost the country $57 to $65 billion per year." Schmitt, John; Warner, Kris and Gupta, Sarika, "Ex-offenders and the Labor Market," Center for Economic and Policy Research (Washington, DC: November 2010), p. 14. "Although the image contained within such quotes is of an external threat associated with the drugs trade, in fact, as May and colleagues were able to show, some of the drug-dealing markets were very much part of the local community – involving people who had lived within the local community for many years. Other drug markets in other areas involved individuals who had no connection to the wider community and whose activities were seen as threatening the local area. While May and colleagues point to the various negative impacts of local drug-selling activities on the wider community, they also point out that such markets could be seen as having a positive impact on the surrounding community. For example, the presence of a drug-dealing market could mean the influx of substantial cash that would otherwise not occur as local drug dealers spent the money earned from their drug-selling activities. Similarly, it was claimed by some of those interviewed that the presence of a drug-dealing market could result in lower levels of other crimes as the drug sellers themselves sought to reduce the activities of other criminals that might attract unwanted police attention. Finally, the presence of a drug market could sustain a thriving market in stolen goods being transacted as a way of supporting a drug habit, one of the results of this being that local people had access to a level of consumer products at reduced prices that they might otherwise never be able to afford." Lloyd, Charlie and McKeganey, Neil, "Drugs Research: An overview of evidence and questions for policy," Joseph Rowntree Foundation (London, United Kingdom: June 2010), p. 43. "Although residents of disadvantaged neighborhoods, neighborhoods with high concentrations of minorities, and neighborhoods with high population densities reported much higher levels of visible drug sales, they reported only slightly higher levels of drug use, along with somewhat higher levels of drug dependency. This finding indicates that conflating drug sales with use, so that poor and minority areas are assumed to be the focus of the problem of drug use, is plainly wrong. The finding is based on the data collected across 41 sites, including city and suburban (but not rural) areas in all regions." Saxe, Leonard, PhD, Charles Kadushin, PhD, Andrew Beveridge, PhD, et al., "The Visibility of Illicit Drugs: Implications for Community-Based Drug Control Strategies," American Journal of Public Health (Washington, DC: American Public Health Association, Dec. 2001), Vol. 91, No. 12, p. 1991. "Although serious drug use is slightly more prevalent in poor minority neighborhoods than elsewhere, the major problem for disadvantaged neighborhoods is drug distribution. These communities are victims not only of their own drug abuse but also of a criminal drug market that serves the entire society. The market establishes itself in disadvantaged communities in part because of the low social capital in these neighborhoods. The drug economy further erodes that social capital." Saxe, Leonard, PhD, Charles Kadushin, PhD, Andrew Beveridge, PhD, et al., "The Visibility of Illicit Drugs: Implications for Community-Based Drug Control Strategies," American Journal of Public Health (Washington, DC: American Public Health Association, Dec. 2001), Vol. 91, No. 12, p. 1992. "Nonchronic drug use was not statistically related to either of the labor supply measures, indicating that light or casual drug use did not lead to negative effects on the labor supply." French, Michael T., M. Christopher Roebuck, and Pierre Kebreau Alexandre, "Illicit Drug Use, Employment, and Labor Force Participation," Southern Economic Journal (Southern Economic Association: Oklahoma State University, Stillwater, OK, 2001), 68(2), p. 366. "The economic benefits of new prisons may come from the flow of additional state and federal dollars. In the decennial census, prisoners are counted where they are incarcerated, and many federal and state funding streams are tied to census population counts. According to the U.S. General Accounting Office (2003), the federal government distributes over $140 billion in grant money to state and local governments through formula-based grants. Formula grant money is in part based on census data and covers programs such as Medicaid, Foster Care, Adoption Assistance, and Social Services Block Grant (U.S. General Accounting Office 2003). Within a state, funding for community health services, road construction and repair, public housing, local law enforcement, and public libraries are all driven by population counts from the census." Lawrence, Sarah and Jeremy Travis, "The New Landscape of Imprisonment: Mapping America's Prison Expansion" (Washington, DC: Urban Institute, April 2004), p. 3. The average "dealer" holds a low-wage job and sells part-time to obtain drugs for his or her own use. "Earnings for drug selling were positively correlated (though weakly) with legitimate earnings. Drug selling seemed to be a complement to, rather than a substitute for, legitimate employment." Reuter, P., MacCoun, R., & Murphy, P., Money from Crime: A Study of the Economics of Drug Dealing in Washington DC (Santa Monica, CA: The RAND Corporation, 1990), pp. 49-50. "The few studies on the local economic impacts of prisons to date have not found significant positive impacts. For example, a study by the Sentencing Project challenges the notion that a new prison brings economic benefits to smaller communities. Using 25 years of data from New York State rural counties, the authors looked at employment rates and per capita income and found 'no significant difference or discernible pattern of economic trends' between counties that were home to a prison and counties that were not home to a prison (King, Mauer, and Huling 2003). According to a recent study by Iowa State University, many towns that made sizeable investments in prisons did not reap the economic gains that were predicted (Besser 2003). Another analysis in Texas found no impacts as measured by consumer spending in nearly three-fourths of the areas examined (Chuang 1998)." "While the aim of SSI [Supplemental Security Income] addiction disability termination was, for conservatives, to force individuals to take greater responsibility in their lives and to decrease dependence on governmentally funded programs, this goal appears nearly impossible to achieve given the lack of resources had by this under-skilled and poor population. Nor did the policy change necessarily decrease their risk of continued involvement in drugs and crime. We estimate that losing a stable housing situation has placed respondents at greater risk for continued drug and alcohol use, something not considered by extant etiological work on individual substance abuse. These consequences could mean a greater dependence of this population on state and federally funded programs." Anderson, Tammy L., Caitlin Shannon, Igor Schyb, and Paul Goldstein, "Welfare Reform and Housing: Assessing the Impact to Substance Abusers," Journal of Drug Issues (Tallahassee, FL: Florida State University, Winter 2002), Vol. 32, No. 1, p. 290. "First, PRWORA of 1996 has destabilized the housing situations of the respondents and has placed them at greater risk for various types of housing problems and homelessness. Second, these housing complications have exacerbated numerous social problems (drug and alcohol abuse, crime, and victimization). It is important to consider, however, that changes in the housing market, decreased housing subsidies, and individual characteristics and behaviors also played a role in these negative outcomes. "More specifically, we found considerable housing dependency, at some level, for all respondents, albeit most often among those who currently had no SSI benefits. Problematic dependence on family, friends, and significant others (doubling up or sharing housing with other adults) was most common, followed by dependence on state-funded program. Independent living (e.g., having one's own place and paying one's own rent), which we would hope for most by middle-age, was an uncommon occurrence." Anderson, Tammy L., Caitlin Shannon, Igor Schyb, and Paul Goldstein, "Welfare Reform and Housing: Assessing the Impact to Substance Abusers," Journal of Drug Issues (Tallahassee, FL: Florida State University, Winter 2002), Vol. 32, No. 1, pp. 288-289. "A qualitative analysis, featuring in-depth interviews with 101, nonrandomly selected former recipients revealed that disability benefits promoted housing autonomy, successful cohabitation, and overall housing stability. The termination of benefits, at a time of diminishing social services (e.g., cash and housing assistance) and a housing market explosion, increased various types of homelessness for respondents and dependency on family and friends. Such negative living outcomes, in turn, further escalated the risk of drug and alcohol use, criminal participation, and victimization." Anderson, Tammy L., Caitlin Shannon, Igor Schyb, and Paul Goldstein, "Welfare Reform and Housing: Assessing the Impact to Substance Abusers," Journal of Drug Issues (Tallahassee, FL: Florida State University, Winter 2002), Vol. 32, No. 1, p. 265. In a report funded by the Wisconsin Policy Research Institute, researchers concluded that "drug sales in poor neighborhoods are part of a growing informal economy which has expanded and innovatively organized in response to the loss of good jobs." The report characterizes drug dealing as "fundamentally a lower class response [to the information economy] by men and women with little formal education and few formal skills," and the report notes "If the jobs won't be created by either the public or private sector, then poor people will have to create the jobs themselves." Hagedorn, John M., Ph.D., The Business of Drug Dealing in Milwaukee (Milwaukee, WI: Wisconsin Policy Research Institute, 1998), p. 3. "In the most common English usage decriminalisation is the elimination of a conduct or activity from the sphere of criminal law, while depenalisation is simply the relaxation of the penal sanction provided for by law. The term decriminalisation is most commonly used in reference to offences related to drug consumption and usually manifested by the imposition of sanctions of a different kind (administrative) or the abolition of all sanctions; other (non-criminal) laws can then regulate the conduct or activity that has been decriminalised. Depenalisation can refer to consumption-related offences (which may be dealt with through referral schemes or alternative sanctions for drug users) but also to small-scale trading, generally indicating elimination or reduction of custodial penalties, although the conduct or activity remains a criminal offence. Confusingly, in Spanish, depenalisation often refers to what in English is most often called decriminalisation. Legalisation is the removal from the sphere of criminal law of all drug-related offences: use, possession, cultivation, production, trading, and so on. Regulation refers to a strictly controlled legal market, in which administrative rather than criminal law regulates production, distribution and price (by taxation); and limits availability and access, using models developed for pharmaceutical drugs, alcohol and tobacco." Jelsma, Martin, "The Development of International Drug Control: Lessons Learned and Strategic Challenges for the Future," Global Commission on Drug Policies (Rio de Janeiro, Brazil: January 2011), p. 9. "The prescription model is the most tightly controlled and enforced drug supply model currently in operation. Under this model, drugs are prescribed to a named user by a qualified and licensed medical practitioner. They are dispensed by a licensed practitioner or pharmacist from a licensed pharmacy or other designated outlet." "The pharmacy model, whilst still working within a clearly defined medical framework, is less restrictive and controlling than the prescription model. Pharmacists are trained and licensed to dispense prescriptions, although they cannot write them. They can also sell certain generally lower risk medical drugs from behind the counter." "Current best practice in licensed sales of alcohol and tobacco offers a less restrictive, more flexible infrastructure for the licensed sales of certain lower risk non-medical drugs (see: 5.1 Alcohol, page 100, and 5.2 Tobacco, page 105). Such a system would put various combinations of regulatory controls in place to manage the vendor, the supply outlet, the product and the purchaser, as appropriate." "Public houses and bars serving alcohol offer the most common example of premises licensed for sale and consumption. Under this long established system, various controls exist over the venue and (in particular) the licensee." "Certain psychoactive substances deemed sufficiently low risk, such as coffee, traditional use of coca tea and some low strength painkillers, are subject to little or no licensing. Here, regulation focuses on standard product descriptions and labelling." Transform Drug Policy Foundation, "After the War on Drugs: Blueprint for Regulation," (Bristol, United Kingdom: September 2009) pp. 20, 23, 24-27. "Prohibition has two effects: on one hand it raises supplier costs, disrupts market functioning and prevents open promotion of the product; on the other, it sacrifices the authorities’ ability to tax transactions and regulate operation of the market, product characteristics and promotional activity of suppliers. The cannabis prevalence rates presented in Figure 1 show clearly that prohibition has failed to prevent widespread use of the drug and leaves open the possibility that it might be easier to control the harmful use of cannabis by regulation of a legal market than to control illicit consumption under prohibition. The contrast between the general welcome for tobacco regulation (including bans on smoking in public places) and the deep suspicion of prohibition policy on cannabis is striking and suggests that a middle course of legalised but limited consumption may find a public consensus." "Pudney, Stephen, "Drugs Policy – What Should We Do About Cannabis?" Centre for Economic Policy Research (London, United Kingdom: April 2009), p. 23. "The legislature directed the Washington State Institute for Public Policy (Institute) to evaluate the costs and benefits of certain juvenile and adult criminal justice policies, violence prevention programs, and other efforts to decrease particular 'at-risk' behaviors of youth." With regard to adult offender drug treatment programs, it found, "Generally, drug treatment for adult offenders works to lower criminal recidivism rates. The degree to which recidivism is reduced is not large—single digit, not double digit, percentage reductions in recidivism rates should be expected. Nonetheless, with treatment typically costing about $2,500 per participant, the net economics of drug treatment appear positive, on average. The programs roughly break even from a taxpayer-only perspective and, including the benefits crime victims receive when recidivism rates are reduced, the programs typically produce about three dollars in benefits per dollar of cost." Click here for complete datatable of Benefit to Cost Ratios of Adult Drug Treatment Programs. Aos, Steve; Phipps, Polly; Barnoski, Robert; Lieb, Roxanne, "The Comparative Costs and Benefits of Programs to Reduce Crime," Washington State Institute for Public Policy (Olympia, WA: May 2001), pp. 1, 23-26.